“Honest” money is universally used, has intrinsic value, retains its purchasing power and cannot be counterfeited by individuals or bankers. Individuals, corporations, and governments spend less than their income. Governments and bankers support and encourage real accounting and “honest” money. Alas, we live in a 21st century swamp of debt and economic nonsense. Debt has exploded higher during the last century. 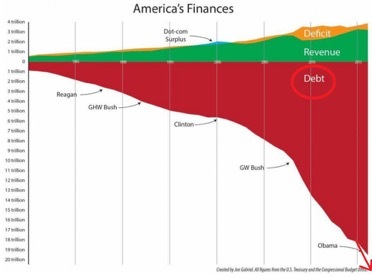 Example: S. national debt has expanded from $3 billion in 1913 to over $21 trillion in 2018. Currencies have devolved to IOU’s (debts) issued by central banks who promote ever-increasing currency in circulation, expanding debt and continuous devaluation of the purchasing power of their currencies. 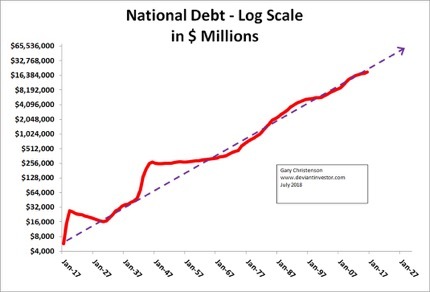 Official National Debt since 1917 – UP! 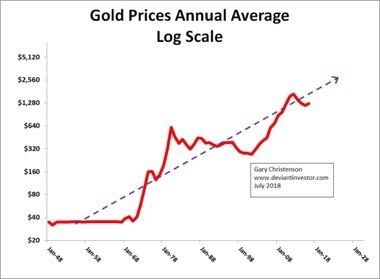 However, gold and silver protect purchasing power as bankers devalue their currencies. The stock market, sometimes, is another means of protecting purchasing power. Central banks and commercial banks create dollars, yen, euros, and pounds, diluting the value of all existing fiat currencies. Consumers and investors must protect their purchasing power! How do you protect your purchasing power? Use stocks, bonds, real estate, silver, gold, and more. 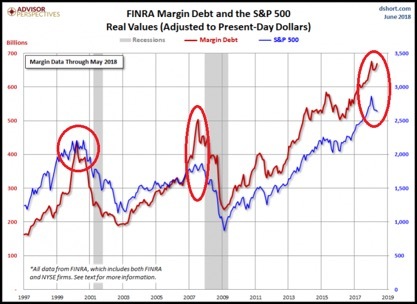 The problem with stocks—they are dangerously high. 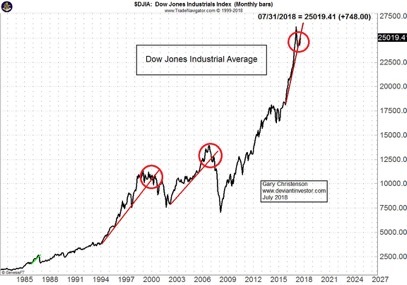 Examine the above graph of the DOW Index. It peaked in January 2018. Risk is larger than potential reward. 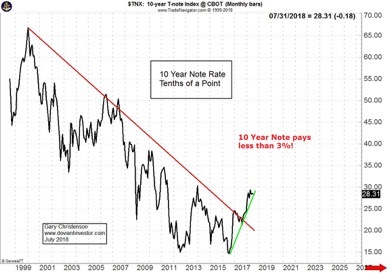 The problem with bonds: Bonds yield little and pay in currencies guaranteed to depreciate. The elite can wait for a friendly central banker to bail out their investments, but most individuals cannot. 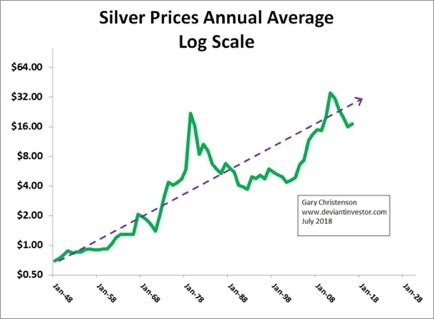 The “problems” with gold and silver: They are anonymous, safe, retain their value over centuries and are not another party’s liability. They cannot be counterfeited by central banks or governments. Many investors see the above not as problems, but as benefits! Western central bankers believe gold and silver threaten their fiat currency monopoly. They want everyone locked into their unbacked debt based fiat currencies. Good for bankers… tough luck for the rest of us. In summary, the global financial system, based on “dishonest” fiat currencies, is dangerous and unstable due to massive and unpayable debts. Potential wars with North Korea, Russia, Iran and China will intensify already dangerous economic instability. Existing wars in Syria, Iraq, Afghanistan and elsewhere are costly in terms of soldier deaths and expenditures, which increase debt. Central banks and governments want more debt, more currency in circulation, and higher prices, so… expect more wars. Massive and unpayable debt, out-of-control spending, and central bank “printing” of currencies cause the inevitable destruction of currencies. 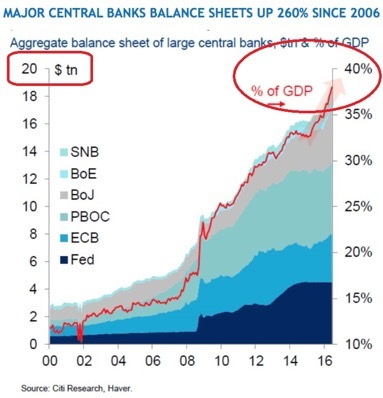 The western central bank answer: Levitate stocks, boost bonds, push interest rates near zero, make “war on cash” and create more debt. The Asians answer: Accumulate gold, lots of gold. Western vaults shipped 1,000s of metric tons of gold bullion to Asia in the past several years. 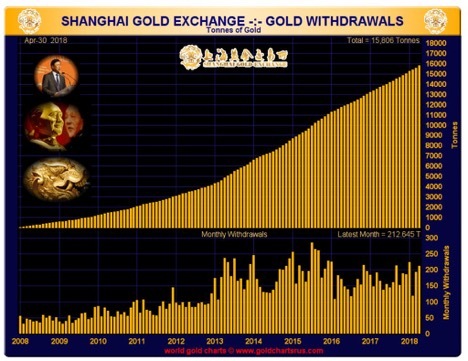 Asians have mined and purchased gold because Russia, India and China want gold more than unbacked debt. Examine the graph below. We have been warned about destruction of purchasing power! Miles Franklin will accept digital and fiat dollars for real gold and silver bullion and coins. Call them at 1-800-822-8080.